The continuation of the complete chronological output of this important band including an unissued test of “Was it a Dream?”. Leo McConville, Fuzzy Farrar, Phil Napoleon (t), Tommy Dorsey (t,tb), Glenn Miller (tb, arr), Jimmy Dorsey (cl,as), Arnold Brilhart (cl,as,f), Herbert Spencer (ts), unknown (vn), Arthur Schutt (p), Eddie Lang (g), Hank Stern (bb), Stan King (d), Smith Ballew, Bing Crosby, unknown chorus (v). Justin Ring cond. Leo McConville, Fuzzy Farrar, Phil Napoleon (t), Tommy Dorsey, Glenn Miller (tb), Ollie Boyd (cl), Jimmy Dorsey (cl,as), Arnold Brilhart (as), Jim Crossan (ts), Irving Kohn (o), Phil Raines (bsn), Murray Kellner, Sam Rates, Nat Brusiloff, Sam Freed (vn), Emil Stark (vc), Arthur Schutt (p), Eddie Lang (g), Hank Stern (bb), Joe Tarto (sb), Stan King (d), Chauncey Morehouse (d, vib), Smith Ballew (v), George Crozier (arr). Tommy Dorsey (t), Frank Signorelli (p), Eddie Lang (g), Stan King (d). Jimmy Dorsey (cl,as) acc. by Leo McConville, Mannie Klein (t), Tommy Dorsey (tb), Alfie Evans (as), Paul Mason (ts), Arthur Schutt (p), Eddie Lang (g), Joe Tarto (sb), Stan King (d). 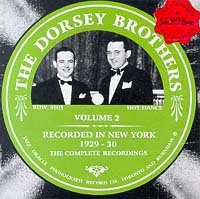 Leo McConville, Mannie Klein (t), Tommy Dorsey (t,tb), Jimmy Dorsey (cl,as), Alfie Evans (as), Paul Mason (ts), Arthur Schutt (p), Tony Colucci (bjo), Hank Stern (bb), Stan King (d), Irving Kaufman (v). Leo McConville, Mannie Klein (t), Tommy Dorsey (tb), Jimmy Dorsey (cl,as), Larry Abbott (as), Lucien Smith (ts,vc), Arthur Schutt (p), Eddie Lang (g), Hank Stern (bb), Stan King (d), Irving Kaufman (v). Muggsy Spanier, Mannie Klein, Frank Guarente (t), Tommy Dorsey, Joe Yukl (tb), Jimmy Dorsey (cl,as), Alfie Evans (as), Herbert Spencer (ts), 2 unknown (vn), Irving Brodsky (p), Carl Kress (g), Joe Tarto (bb,sb), Ray Bauduc (d), Scrappy Lambert (v). Dr. Eugene Ormandy conducting Leo McConville, Fuzzy Farrar, Mickey Bloom, ?Manny Klein (t), Tommy Dorsey, Carl Loffler (tb), Jimmy Dorsey (cl,as), Max Farley (as,f), Arnold Brilhart (as), Bill Green (ts), Al Duffy, Leo Kroucrick, 2 others (vn), Arthur Schutt (p), Jack Hansen (bb), Jimmy Mullen (sb), Charles Dondron (vib), Smith Ballew, Hal Kemp, Nye Mayhew, Saxie Dowell, Skinny Ennis (v), George Crozier (arr).